Peel the potatoes. Slice them about 1/2 inch thick. Grate the cheese over a bowl, then add two eggs and half cup of sour cream. Taste the cheese in order to see if you need to add salt to the food or not. Preheat the oven at 400F. Oil a baking dish. 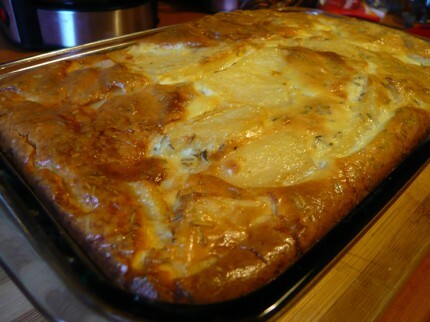 Put one layer of potatoes in the dish, then pour the egg-cheese mixture over it. 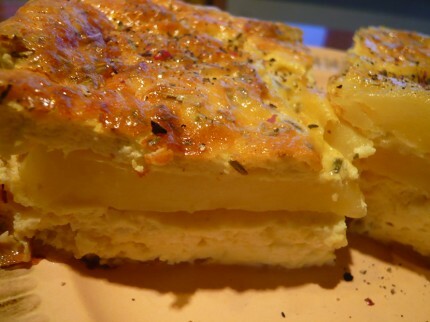 Arrange another layer of potato slices on top. In a small bowl, beat the two remaining eggs, them add the other half cup of sour cream, the thyme and the curry powder. Pour this over the potatoes, covering all of them. Let the cheesy potatoes cool for about 5 minutes before cutting and serving them.